The King Faisal Center for Research and Islamic Studies concluded the activities of the "Saudi-Sino Cultural Dialogue" organized by the Center in January. A number of lectures and panel discussions were held with the participation of a number of officials, academics, researchers, and businessmen from the Kingdom and China. The lecture entitled “The Road to China: Seaborne Exploration in Medieval Islam" by Dr. Dionisius Agios, Professor of Arabic and Islamic Material Culture at the University of Exeter, was held in the presence of a number of political experts, academics, ambassadors of foreign countries and public figures at the Alfaisal Institute for Human Resources and Development in Riyadh, on Monday, 29 January 2017. 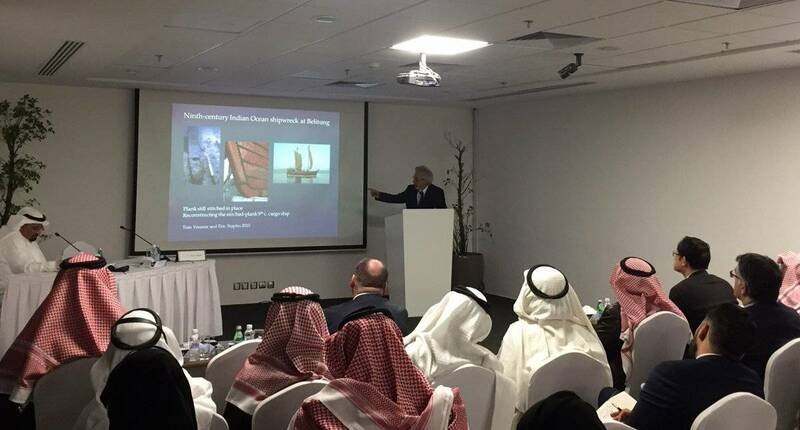 During his lecture, Dr. Agios said that sea and mainland trade with China was one of the most important aspects of the flourishing of Islam in the Middle Ages, as well as the Hajj, which contributed to the trade and cultural exchange between Arabs and Muslims on the one hand, and Chinese on the other. He pointed out that the voyages to China were a great danger for the medieval travelers of the Islamic era, and that the passengers were risking their lives because of poor security factors and poor conditions on the ships for sailors and passengers in terms of water shortage, poor sanitation and overcrowding. According Dr. Agios, the Silk Road was one of the most important routes linking China to the Arab and Islamic worlds. It enabled the transportation of iron, copper, perfume, ivory, silk, gold, amber, ceramics, precious stones and others. Dr. Agios described the various technologies and types of ships that were used by sailors in the Indian ocean. Calicut (Kerala) and Ceylon (Sri Lanka) were the main connecting nodes in this maritime network. He also discussed how successful sailing to and from China depended on various factors, including the monsoon winds, the use of astronomy, the compass, and the experience of the crew. There was a common commercial language shared by traders and sailors across the Indian Ocean. The activities of the "Saudi-Sino Cultural Dialogue" organized by the King Faisal Center for Research and Islamic Studies in January witnessed a number of cultural events, which began with a panel discussion entitled "Security in the Gulf Region and GCC-China Relations" with delegation from Peking University, and a lecture by Professor Yan Xuetong, Dean of the Institute of Modern International Relations at Tsinghua University under the title "China and the Changing World Order", and concluding with a lecture by Dr. Dionisius Agios, Professor of Arabic and Islamic Material Culture at the University of Exeter, entitled "The Road to China: Seaborne Exploration in Medieval Islam. " The event also included the inauguration of the Chinese version of the Center’s website by HRH Prince Turki Alfaisal, Chairman of the Board of Trustees, in the presence of Chinese Ambassador to the Kingdom, Li Huaxin. This makes the King Faisal Center the first research center in the Arab world to have a website in the Chinese language.